German Foreign Minister Sigmar Gabriel Thursday indicated that the behavior of the current Turkish leadership is the major roadblock in the way of the country’s membership to the European Union. “It is clear that in this state, Turkey will never become a member of the EU,” Gabriel told German popular newspaper Bild. Germany and the EU bloc have been wary of the behavior of the Turkish leadership, accusing the Turkish President of cracking down on dissents and muzzling democracy. The EU has shelved Turkey’s membership talks over several reasons including democracy deterioration. The bloc also feared sweeping powers seizure by Erdogan during April referendum and Ankara’s nationwide crackdown following last year failed military coup. Ankara has accused Berlin of proving shelter to terrorists, in reference to members of Gülenist Group (FETÖ) and the PKK it lists as terror groups. Tension has further risen between Ankara and Berlin recently after Turkish police forces have detained a Turkish-German journalist and a German human rights activist. Also, prior to the referendum, Erdogan accused Berlin of Nazi-like behavior after Turkish officials were denied permission to campaign in Germany. 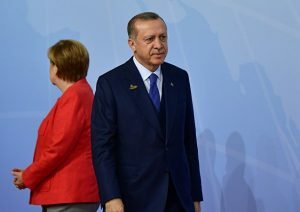 Germany and several other EU countries have recently indicated that they would oppose Turkey’s bid to host the next NATO meeting. To further hype the tension between the two countries, Erdogan urged German Turks to boycott Germany’s main parties in next month’s general election. About 3 million Turks live in Germany. Half of the number can vote in the election on September 24. Written by: KanelkaTagba on August 25, 2017. Posted by KanelkaTagba on Aug 25 2017. Filed under Headlines, World News. You can follow any responses to this entry through the RSS 2.0. Both comments and pings are currently closed.